I have so much to say and figured I would write a letter to release some of the things on my mind and in my heart. Writing has been a major healing tool in my recovery journey. So much floods my mind on what to say and how to say it. I guess I really wanted to write because it’s a few days before my birthday and I always get really sad around this time, thinking of you and the events that happened that day. As soon as August hits, it overwhelms me like a tsunami of emotions. Truthfully, I wish it would just go away. It has an impact on my life, and it’s not in a positive way. I was thinking if I wrote you a letter it might help. I can only try. My feelings have been hurt for years about you not keeping your word when you promised me you would write me, and send me pictures. I waited for over 20 years and you never sent them. Every time I checked the mail, another disappointment. You lied. I’ve done a lot of research on mothers who have given their babies up for adoption, as a way to try to understand you better. I think I’ve learned quite a bit of things. I read “The Girls That Went Away” and it helped me understand the loss that some of the mothers felt after they were forced to give their babies up. My heart aches for them. I guess the picture I painted of you when I was growing up is that “You loved me so much”, because that’s what I was always told. Your actions have proven me otherwise. I always believed growing up you would want a relationship with me, and want me in your life. After all if you loved me so much, why would you not want me in your life? I had such high hopes for our relationship and I always wanted to have a relationship with you. After I found you, 21 years ago and met you one time I learned that the picture I had painted of you based on what I was told by my adoptive mother, wasn’t the real picture at all. I’m not sure any adoptee would be able to expect their biological mother shutting them out after meeting just one time, because I’m still trying to figure out how someone prepares for that? I always blamed myself. The wound from being separated from you began the moment I was born, and over the years it got deeper and deeper. After I found you and you shut me out, (rejected me) it only felt like a deep gaping hole in my heart that caused me the biggest amount of heartache I could have ever imagined. How does a mother reject their own child? I have been heartbroken my entire life, and you left this world with no explanation as to WHY?! You never did tell me why you couldn’t have a relationship with me. But I have asked other first mothers, and I’ve done research to try to understand. Some say you weren’t rejecting me, but you were rejecting the pain of relinquishment. Looking at the big picture, I know you were an alcoholic and at your funeral people told me they never saw you without a drink in your hand, even during your pregnancies. I believe alcohol took away your pain from relinquishment, as a temporary fix. I believe you never recovered from the shame you felt from being pregnant with me. I asked you who my birth father was, and you lied to me telling me he was dead, he didn’t know about me and he wouldn’t want too. Well… You were right about him not knowing about me and him not wanting to, but he wasn’t dead. Your lie stalled me from finding and knowing my biological brother by over 20 years. If you would have told me the truth, I would have seen my nieces be born. I wouldn’t have missed so many holidays away from MY family! You keeping me a secret from everyone, so you wouldn’t have to face the fact that you had an affair with a married man who was a friend of the family. Shame on you for your actions, but I believe you thought you were doing the right thing. I believe you thought I would have a better life, keeping my truth hidden, and pretending like I never was born, like your mistake never happened. Well let me just tell you, I can’t judge you for your actions because if I’m honest I’m no different than you. We all make mistakes. But I’m at a place seeking healing for my life. I’m seeking clarity, and understanding from all around the board regarding how I came into this world, and where I came from. You pretending I didn’t exist only harmed me even more than being separated from you at the beginning of life. I know in the 70’s things were different. But I needed to know my truth. I needed to know where I came from, and you kept the truth from me to protect yourself from your shame filled actions. Do you know that in order to heal, I needed my truth? When you died, and I sat at your funeral I wasn’t listed in your obituary. Do you have any idea how much pain that caused me? I really don’t think you care, because you died a hurting woman. After asking to go visit your house, so I could see how you lived, and what your house looked like I gained some closure and a better understanding of what your last days on earth were like. I was told you shut everyone out, even your other daughter. You shut your friends out, even neighbors who came to check on you. Your house was filthy, and dust was an inch thick and it looked like everything in your house was from a scene from a 1970’s movie, which was when I was relinquished. I got the most eerie feeling when I was there. I truly believe your life never was happy after you relinquished me. Nothing changed. It was dark in your house. The drapes and couch were very dark, and a pattern from the 70’s and you died in 2010. I went upstairs to see your room, and again everything was like a scene from the 70’s. Being able to see this brought me some understanding that you indeed were a hurting woman. You died all alone, an alcoholic and with COPD as a long time smoker. It hurt my heart that you would rather die that way, than have me in your life… But it also tells me that’s how great your pain was. It was greater than you feeling like you could allow me in your life. It has made me sad for you. I know you didn’t know Jesus, even when they mentioned him at your funeral. I know if I grew up in your home, I wouldn’t know Jesus either. That is the only reason I can say I’m thankful I was given up for adoption. I need to be real about that.. That’s a pretty important reason! I wish I could have lead you to the lord, so I would know you were in heaven but unfortunately that didn’t happen. I think of you and I think of a sad, bitter, angry hurting woman. I think of someone that didn’t have any tools to heal her hurt, and I think of someone that died an alcoholic. The way you were inspired me to be better than that. I didn’t want to die an alcoholic and all alone. I wanted to be a happy healthy mom, for my kids and my future grandkids. I don’t want to be anything like you. August 12, 2012 I quit drinking. After I found out you were an alcoholic, and then I found my birth father and he was an alcoholic I knew drinking wasn’t for me. I was upset at you for many years for lying to me about my birth father. I’m thankful your sister gave me his information 2 months before she passed away. If she wouldn’t have I never would have found my brother. I drive to Jimmie’s door (my birth fathers) and he remembered you. He acknowledged the affair you all had in 1973, while he was married to Charlotte. He expressed never knowing you were pregnant or anything about you having me and giving me up for adoption. Do you realize you stole his rights at being a father? I’m his only daughter, and because he didn’t know anything about me he won’t accept me as his daughter! This has made me very angry over the years. Who do you think you are to play with people’s lives like this? Everyone on the planet deserves to know where they come from. It was so not fair for you to lie to him, and keep the pregnancy a secret to protect yourself from your irresponsible actions being exposed. You thought about yourself, not me. You will never know how that has impacted me in my life. Never knowing who I look like or where I come from has been very traumatic for me and it’s been an entire lifetime. No one has ever understood my pain until I have recently connected with hundreds of adoptees who get it. I have always wished you choose abortion, and if anyone walked in my shoes even one day, they might wish the same thing. I’m working on being thankful for my life, but it’s really hard when you are brought into the world under such shame and secrecy, and the WORLD just expects you to be thankful for losing an entire family. All I ever wanted was you. I didn’t want anything of material value, only you. I wanted to sit and talk to you and get to know you. I wanted to see what things you liked, and to spend time with you. I hear other people talk about their mothers, and the memories they have with them before they pass away and I get resentful because at least they have the memories. Then I hear people talk of the heirlooms they are passed from their mothers, grandmothers, etc. I get resentful because I wonder if they really valued those things. Being adopted you are robbed of all that. I could care less about the heirlooms; it’s the lost time and memories I have an extremely hard time with. I was robbed of the memoires, and there is nothing on this earth I can do to get them back. If only everyone knew how valuable a memory was, they might be more thankful for them. I’m sorry you died all alone. If you would have let me in your life, I would have taken care of you. This hurt my heart deeply that you would rather die all alone, than have me in your life. For years I felt like I did something wrong, but I learned later that your shame is why you turned me away. When my adoptive parents divorced when I was one, and you found out about it after we met I was told by your best friend that it devastated you and you were extremely upset because if that was going to happen, you would have raised me in a single parent household like my adoptive mother did. I am sure that hurt you, because you were promised I would have a better life. I remember after you found this out, you never spoke to me again. I guess it might have hurt you that bad? When you asked about my life growing up, and how it was I was honest with you. I told you the truth and I believe it was hard for you to grasp. I think it was easier for you to shut me out, than to face the fact that the BETTER LIFE you were promised wasn’t better at all. Only different. I think this broke your heart, and it was easier for you to close the door on us ever having a relationship, and continue to drink alcohol to numb your pain, (oh boy do I know all about that!) and continue on with your life like I never existed. You see, I can honestly say I can understand that the pain was too great for you. But I will never understand how a mother rejects their own child. I dreamed of knowing you my entire life. They lied to me and told me you LOVED ME SO MUCH! That was a lie. You didn’t love me. You wanted to forget all about me. You never wanted a relationship with me. Not all mothers love their babies, and that is the TRUTH! I hear people (especially adoptive parents) speak for birth mothers all the time, “She loved you so much, her decision was such a selfless decision, and she always has you in her heart!”… NO ONE, I MEAN NO ONE CAN SPEAK FOR ALL BIRTH MOTHERS! NOT ALL BIRTH MOTHERS LOVED THEIR BABIES! This was the lie that I believed my whole life, and that LIE caused me the most heartache ever. Her actions showed me the truth. I will never forget the lies in adoption. Such deception and manipulation and all for a family to be able to have a happy healthy baby with a clean slate. All at the cost of every single memory I would have had with my biological family. You see, why am I so mad the memories are gone when reality is YOU didn’t want me in your life anyway? Its heartbreak either way for me. The reality is I never could accept anything when I didn’t know my truth. It took me 20+ years to find my truth, and I had to do it all on my own with no help and no support. Every single milestone of reunion I embraced solo, and every heartache I kept to myself. The reunion navigation is a VERY EMOTIONAL TIME. I’m still sending messages to “BIO” family members only for them to ignore me, and reject me because they had no idea I existed. I’m still facing rejection after all these years. What this experience has left me is the fact that even when you didn’t plan me, I believe with my whole heart God did. I’m still trying to figure out WHY? And certain times when I’m at my low points, I get angry with God because if he knew I was going to be in this much pain, WHY AM I EVEN HERE? Then I remember, adoption of the world today isn’t the ADOPTION GOD SPOKE ABOUT IN THE BIBLE. MY PAIN IS FROM THE SECRETS AND LIES IN ADOPTION AND I KNOW SECRETS AND LIES AREN’T FROM GOD. GOD IS A GOD OF TRUTH SO I KNOW IT’S NOT HIS FAULT. IT’S THOSE WHO SUPPORT THE SECRETS AND LIES IN ADOPTIONS FAULT. Anytime a human beings identity is falsified, and names are changed, and birth certificates are changed, and a new born baby or a child is considered a blank slate, then deception kicks in and it’s nothing close to adoption as God intended it. I will never believe God intended for my heart to be broken my entire life, wondering and searching for my people! I have found everyone but the WORLD (Closed adoption Industry) still refuses to give me my original birth certificate. So you see birth mother, you are long gone but the realities of my adoption experience impact my life in every way imaginable. I wish it was over that day you walked out of the hospital and forgot all about me. But the truth is, it’s stayed with me throughout my entire life. Let me tell you I have done everything in my power to heal from this experience. I stopped drinking August 12, 2012. So the pain was flooding in, the realities and the FOG lifted and my TRUTH became more real than ever. This was my first step in recovering from my adoption experience. Alcohol or drugs doesn’t do ANYTHING but prolong our healing and distort the truth. Now that I see my truth CLEARLY I can accept it, and move forward with healing. I started writing and sharing my adoptee feelings in 2011, before I ever stopped drinking. I was writing from a place of anger, and really deep hurt so my writing was very angry. Over the last 3 years, I’ve started a ministry called Celebrate Recovery, where I have been able to put every single issue I have out on the table and one of the main things I prayed for was GRACE. I needed God’s grace, to come into my life so my anger could turn to something positive. God has given me that grace. I am working on healing the way I feel about my dreaded birthday. Today is August 9, 2015. I will be 41 in a few days, and I really want to just be at a peaceful place with this day but all I think about is the loss associated with that day. The loss no one recognizes unless they are adopted. I’ve been working hard at accepting that no matter how I came into this world, God was the ultimate planner of me being here. I WANT TO ACCEPT I’M HERE BECAUSE HE HAS A PLAN AND PURPOSE FOR MY LIFE. If I’m honest, my blog and being able to reach out to other adoptees is enough for me. My fellow adoptees make all my adoptee pain worth it. My kids give me a reason to be here, so I am trying to trust and believe God has a plan for my life. Writing you has helped me release some things I needed you to know. I’ve written for years and I’ve written you 2 letters in the past, and they were both very emotional for me. This one not so much. I believe I’m accepting things for what they are. But the last part I need to share is that GOD has been my ultimate healer regarding my adoption experience. That doesn’t mean I will ever STOP SHARING MY PAIN! We all deserve to be heard, and just because I have the most hurt I have ever experienced from being adopted, and I’m working through my pain doesn’t mean I won’t continue to share my feelings. Do you realize I have never been able to release these feelings until recently? That’s 41 years of feeling the way society expected me to feel and it’s sure known in adoption that if you don’t have a “Happy Bubbly” story it’s just not welcome, or you are being negative, or better yet, “You just had a bad adoption experience!” Yeah I would say anytime a child is separated from their ROOTS & DNA it calls for a “bad experience” especially when the WORLD won’t allow us to grieve our loss. They make us feel like something is wrong with US for feeling the way we do. It’s a total and complete mind f–k to be adopted. I’m so serious about this! I have figured out why this “Mother Wound” has been so extra deep for me. Mainly because of you handing me over to strangers to be raised. And the stranger you passed me to wasn’t capable of being a mother. I really have never had a mother. I was too busy taking care of “her”, and it scared me for life. But it’s easier to accept God as my heavenly father, and he takes the place of my earthly father. I can accept this. But I will say my adoptive dad was an amazing man. He was always great to me, so my “Father Wound” was never as big as my “Mother Wound”. It’s hard for me to replace my “Mother Wound” with God for some reason. I believe a mother sets the foundations for bonding and trust and so many other areas, and without a mother or with the mother bond being destroyed, as a person we miss so much. I’ve been left to figure it out alone and I think I do pretty well considering I didn’t have the mother I deserve. I have prayed about becoming a better mother to my kids than what I had, and I know I haven’t been perfect but I know I have tried my best with all I know how. It has been hard considering I never had a mother example or closeness with a mother ever in my life. It makes me sad. There is no one to go to or talk to like I should be able to. I’m turning to God more and more, but nothing in the world can replace our mother. I just wish you understood that before you decided to give me up. So now, I have written you and told you how I feel. Your decision has impacted me every single day of my life, and I want you to know I’m working towards healing. I’ve accepted what I can’t change, and God has healed my broken heart. The thing I’m working on now is this “birth” day and the dark sadness that comes with that day. Let’s face it; the day I was born was not a happy day. I can think it was happy for you, because you got rid of your problem, but I know deep down you had to be sad that day. It’s a major day of loss and sadness for me. I look forward to the day I can be free from the sadness. I believe it will always be to an extent, but I have FAITH AND BELIEVE that the closer I get with God, the more he will heal all areas of my life. I know that no area is off limits when it comes to him & this is where I get my hope from. I have always loved you, even when you didn’t love me. I would have given anything for a relationship with you, but now I will embrace my spiritual mothers God has put in my life. They don’t kick me to the curb or throw me away like you did. I refuse to believe there is something wrong with me, because God loves me just as I am, not as I should be. Too bad you couldn’t do the same. Your loss. <3The Daughter You Threw Away, But God Rescued Me & I’m Here To Stay. 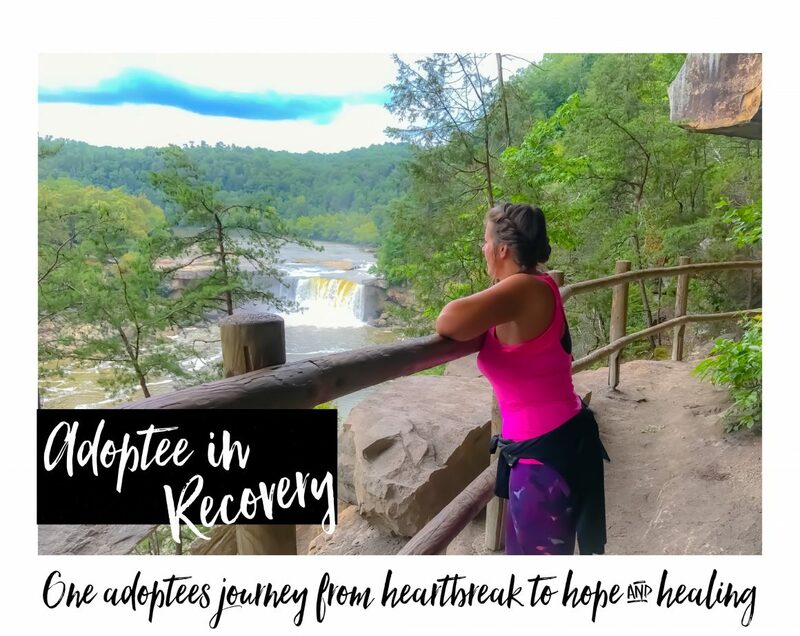 Next ADOPTEE IN RECOVERY VICTORY!- 3 YEAR SOBRIETY! Optimist42- So glad you found my blog and you were moved by it. So sorry you didn’t get to meet your birth mother. I always think of my fellow adoptees because although I feel robbed only getting to meet mine once, it doesn’t even compare to never getting that one chance. I will always be thankful for that once chance, and continue to help other adoptees with their search and reunions so they don’t find a grave. I know it must be so heartbreaking. Have you been able to find out anything about her? So you can get an idea of how she was? My heart aches for the pain that you have been dealing with your entire life. I can’t begin to imagine the hurt one must feel being in a situation as sad as this one. God loves you and I love you. You are such an amazing woman inside and out. Thank you for sharing your world with me.